Choosing an architect when the customer has no specific recommendation is a challenging and long process. The client needs to know the work of the architect and his specific handwriting (or style) as well. In other words, client needs to find out more about architect’s work .The ideal place to present this information is a website. For inspiration you might want to check this list of best-designed architect websites here. Usage of the WordPress editorial system and the quality WordPress template guarantee is your assurance that the final result will look and work on all devices. This theme part absolutely crucial in this case. Good theme (for example Ark – WordPress theme made for freelancers) allows you to create website without writing single line of code. Every man is son of his work and in case of Architecture, this is more true than in other fields. You definitely want to showcase your work! This will provide reassurance to your clients, that you are the right guy for their contracts. Also for “I’m-not-decided” visitors, there should be missed calls for action on the web. Many people in the first phase do not know what they are look for and what the architect can offer them exactly. We have already pre-designed the structure and relevant content of your future Architect website. Just use the pre-created Ark WordPress template pages. Take a look at the list of basic elements you should not forget about when creating an architect’s website. Can the architect design a family house or is better focused on skyscraper buildings? Exactly on such questions a web presentation should clearly respond. You can present individual services in the form of text with an icon, or create simple and separate pages for them, where they are described in more detail. Services should be shown straight on the main page. In addition to the displayed services, you can also place a call to action for each service through a button. It’s great when a visitor can choose the right service, and you can get to your contact information immediately. From the drawing board in the studio to the web! Clients decide according to architect’s reference, so it is very essential to make appropriate space on the web. Within the Ark template and pre-created pages for architects, you have many ways to present a portfolio. Ideal way are large photos with which you can move. The best can be seen one place. Only a very small number of people are able to accurately imagine how the entire creative process of architect goes and how it will actually work in practice. In this case, you can add a slider with a large photo with descriptive text on the web’s background. The visual method of presenting the architectural work is really great and the result has a unique ability to capture at first sight. And what about preparing contacts to keep site visitors always in reach? Exactly this solution represents the Ark template through a pull-down menu, where everything is all essential, including the contact form. There are also classic contact sites where you can place a photo of the residence and the map. You have already had information about the most basic elements that you should not miss on an architect’s website. If you want to work with them without worry, you could not omit a professional WordPress Theme. It saves you time, work and money for web development. A template with a ready-made look for an architect including all the features mentioned above you have. . After purchasing and installing the Ark template do to Settings and under Demo Install, select the Demo named Architect and click the Install Now button. In the record time , you will have a fully responsive, design-friendly website where you can easily edit everything you need. You have the ability to edit all the elements on the web and its entire appearance. Need to change photos? Edit texts? You will learn it easily and quickly with detailed sophisticated tutorials and videos. The Ark is one of the most highly rated WordPress multipurpose themes on the market. For quite understandable reasons, architects have very high appearance requirements. If you do not want to solve graphics, the Ark template will take care of everything. It makes the work on your WordPress theme based architect site fundamentally easier. You will use Fresh Builder to edit your site. The Fresh Builder is very handy and intuitive tool. Inspire at the sites of architects who have already use the Ark template. Do you have to make further changes on the site? Add some specific features? Do not hesitate to contact us. We are the authors of the Ark and WordPress templates we know detally. We are a committed and coordinated team at your services. 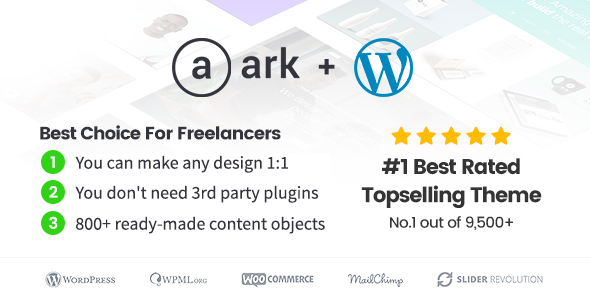 Why create a site absolutely from scratch when the Ark WordPress theme made for freelancers pages are pre-created here! Thanks to them you will create a modern and functional website with minimal budget. If you need advice, we are here for you. We’ll make sure you get the most from the Ark Theme and the WordPress content management system as well.